Together Making Changes is a Supporter of the Alzheimer’s Association! Our TMC family votes on a charitable organization they would like to support every year. 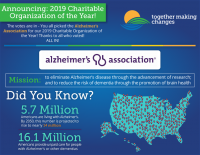 As a Dementia Capable Society Leader, we are happy to announce that they chose our 2019 Together Making Changes National Initiative to be the Alzheimer’s Association!